Most people, when they first hear about elimination communication, are intimidated — terrified, even — at the thought of diaperless babies. I find this hard to picture, because I know so many people who leave diapers off a lot of the time. But I have come to realize that for many parents, leaving the diaper off is simply Not Done. I guess a diaper is so essential and ubiquitous in many people’s picture of babies that they don’t even notice it. It’s like we think it grew there. Another friend who’s a lactation consultant told me she’s experienced a similar level of shock. When she asks people to “get their baby naked” in order to practice skin-to-skin and help breastfeeding, they’re horrified. They’re so scared of getting peed on. “It’s like pee is some sort of irreversible corrosive that scars everyone for life,” she said. And so a lot of people say they can’t do EC, because they’re terrified of pee. But there’s no need to be. First, pee is not corrosive. It is not scarring. It’s not even dangerous. In fact, it’s sterile. You do not need to fear pee. And second, you don’t have to go naked to do EC. Many experienced EC’ers will tell you that it helps. That you’re more aware and tuned in when your baby isn’t wearing a diaper. But I think that depends. And more importantly, the key factor in EC is not that your baby doesn’t wear a diaper. The key factor is that you communicate with your baby — and listen to his communication with you — regarding pee and poop. That can be done with or without a diaper, or a waterproof trainer, or a pair of cotton pants, or an absorbent mat on the floor. Practicing EC does not mean that all pee and poop go in the potty. Practicing EC simply means that you communicate about bodily functions, no matter where they end up going. It’s not a set of rules about how you dress your baby. It’s a way of connecting. And so I believe that you can practice EC full-time while also using diapers all or most of the time. Many babies will signal more clearly when they are not wearing a diaper — but some babies signal more clearly when they are wearing one. Most parents will tune in better to signals when their baby is diaperless (it adds to what another friend of mine describes as “the sense of adventure”), but some parents tune in better to a diapered baby. The best way to practice EC is the way that it works best for you. Me, for instance. I have no fear of taking the diaper off. I do it so often that it actually looks a little odd to me to see a baby in a diaper. 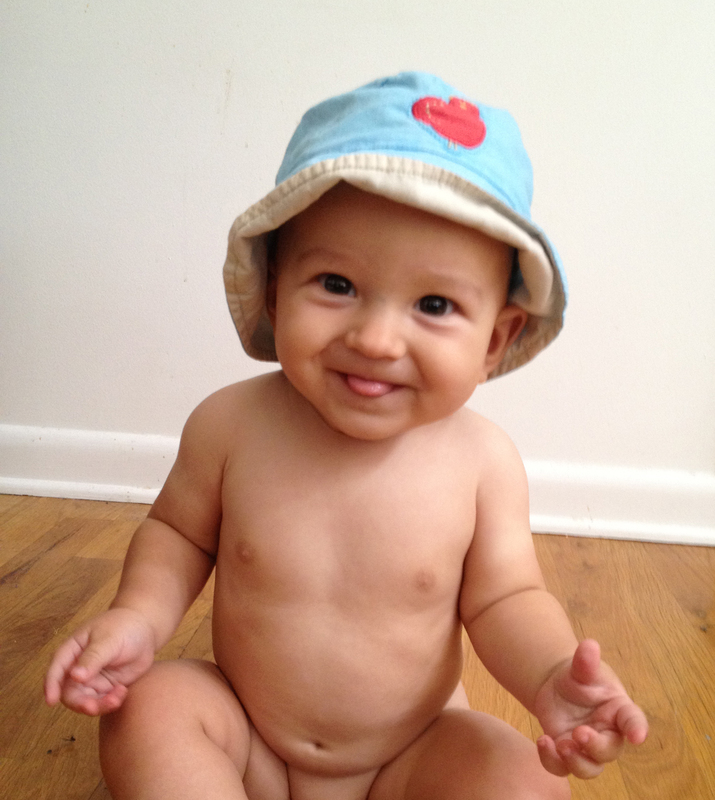 But when my baby is naked on the floor and happily playing, I pay less attention to his signals. Because I could care less if he pees on my hardwood floor. I’ll wipe it up and be done. No big deal. On the other hand, if he pees in my brand-new favorite Green Acres diaper with an embroidered panda on the cover, I will be very sad. Because then I will have to wash the diaper and he will not get to wear it again until it’s washed. And then his whole outfit for the day will be ruined, because I planned his outfit to go with the diaper. And it will be a day or two before I get to dress him in it again. Don’t pee in this diaper! So when he signals in a fancy diaper? The diaper is coming off STAT. Plus, for some people, the “sense of adventure” is actually a disadvantage. When you’re really worried that your baby is going to pee on the floor, you tend to overthink things, imagine the baby is signaling when he’s not, and offer too often. Which interrupts him and annoys him and leads to more misses. If that’s you, then the backup of a diaper could actually allow you to relax, stop worrying, and tune into your intuition — thus increasing your awareness and your catches. So when you’re first getting started with EC, I recommend that you try it both ways and see how it works best for you. Try just offering at diaper changes, or right after waking when babies always need to pee. After you have some catches and feel like you’re getting the hang of it, you can try protecting your floor and spending a morning diaperless to become more aware of signals. Or you can wait till after he’s pooped for the day and then try a diaper-free hour or two. Or you can employ the “three miss” rule: start the day diaperless, and after three misses, put a diaper on. It’s like anything else with parenting: do it the way it works best for you. But no matter how you start — you should try it. Really. Don’t be scared. EC is for everybody. And babies love to be naked. This is awesome, Lisa! I think one of the biggest blocks that people have about EC is the mental image of chasing up a naked baby and cleaning up after pee and poop. But you’re absolutely right! Babies don’t need to go naked to do EC. 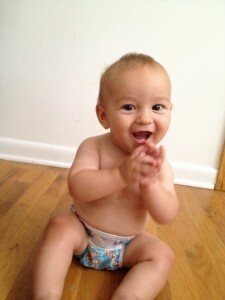 As I recently read on a blog post, with EC, diapers are a tool, not a toilet! I LOVE that panda diaper!! !